A place to call home – Eliminating the feeling of loneliness and desertion, each child becomes a member of the Joy Home family. A permanent home with 3 acres of land as their playground providing a safe and secure environment where the children return to after a hard days schooling. Education – All children above the age of 5 are registered into a local government school which is 1 km walk from Joy Home. The children syllabus includes Mathematics, Science, Social Studies, Computers, Sanskrit and Telugu (the native language of Andhra Pradesh). English is also taught once the children are 5 years of age. Joy Home provides the children with stationery and school uniform as well as funding their school fees. Food and Health Care – The children are provided with a well balanced and nutritious diet. 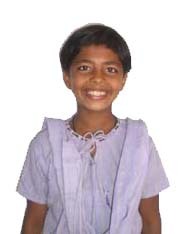 Lunch is provided by the school for the children amd any health care issues that arise are dealt with by Dr. Jyothi. Training and Developing Skills – The children are trained in many different fields to ensure that they are able to become independent in the future. After completion of schooling, children are sent for vocational courses such as nursing, lab technicians, mechanics, computers, electronics etc.